Almost all of Greenland’s ice shield melted at the surface this month, says NASA. 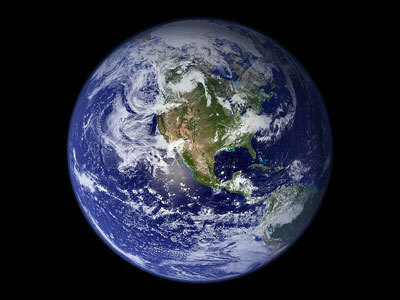 The event, unseen at such a scale in more than 30 years of satellite observations, has puzzled scientists. 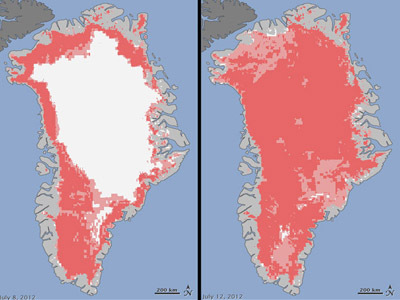 ­Naturally, some of the island’s ice is expected to melt during the summer, but this year’s observations from three NASA satellites have shown something unusual – the melting occurred in a flash and over a widespread area. Even Greenland's coldest and highest place, Summit Station, showed signs of melting. Son Nghiem of NASA's Jet Propulsion Laboratory in California was analyzing radar data from a satellite when he noticed that most of Greenland appeared to have undergone surface melting on July 12. “This was so extraordinary that at first I questioned the result: was this real or was it due to a data error?” NASA cited his words on its website. In a matter of only four days, starting on July 8, the affected area had spread from 40 per cent of the ice shield to a staggering 97 per cent. This by far exceeds the maximum registered level of 55 per cent. Other experts, including NASA ice scientist Tom Wagner, say they are not able to determine at this point whether a rare natural phenomenon is being observed or one triggered by man-made global warming – large-scale melting has happened in Greenland before. Still, they note that the edges of the island's ice sheets have already been thinning due to climate change. Ice core records from Summit show that melting events of this type occur about once every 150 years. Summer in Greenland has been unusually hot this year. That is due to high pressure air that has been accumulating recently over the island, bringing clear weather and prompting ice and snow to melt. Thomas Mote, a climatologist at the University of Georgia, says these events are similar to those affecting the United States, where record-breaking temperatures have caused severe drought.